November 24, 2016 – Montreal, Quebec – Critical Elements Corporation (“Critical Elements” or the “Company”) (TSX-V: CRE) (US OTCQX: CRECF) (FSE: F12) and Platypus Minerals Ltd (ASX: PLP) (“Platypus”) are pleased to announce positive results from the Stage 1 exploration program completed at the Lemare spodumene pegmatite located in the James Bay lithium district in Quebec, Canada (Figure 1). Platypus’ first exploration program at Lemare comprised 16 diamond drill holes, totaling 1,788 m of NQ core, drilled into the Lemare pegmatite along 8 lines spaced a nominal 50 m apart. In conjunction, a program of regional rock chip sampling was undertaken along the projected extension of the pegmatite beyond the bounding lake to the southwest (Figures 2 and 3). Figure 1. Location of the Lemare spodumene project in the James Bay region of Quebec, Canada, in relation to several advanced lithium projects. 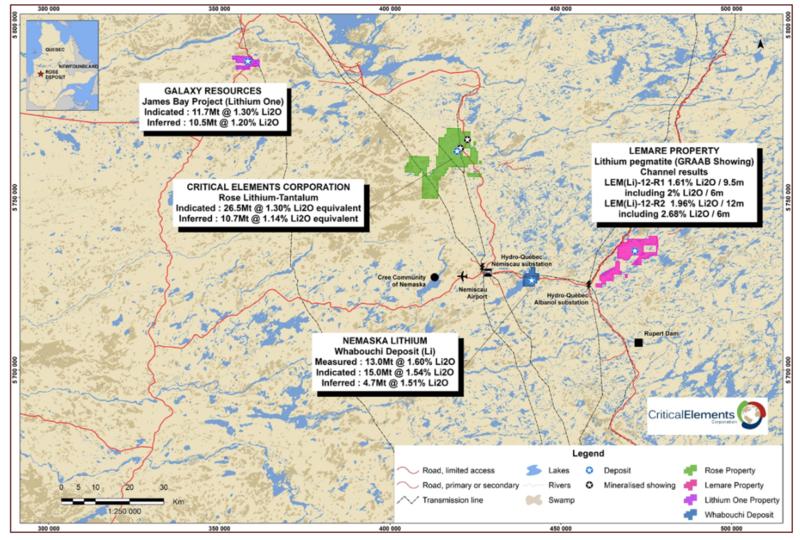 Nemaska Lithium’s Whabouchi project is only 30 km west of Lemare. The drilling confirmed the presence of a high grade spodumene pegmatite that was initially identified by a series of channel samples. This pegmatite is seen to extend at least 300 m along strike and remains open to the NE. It is up to 20 m in true width and pinches and swells both along strike and down dip (Figures 4 and 5). The pegmatite is closed off to the SW where it approaches a lake. Several parallel pegmatites were intersected by the drilling. These are generally low grade and only sporadically mineralized. 23 m @ 1.61% Li2O, including 10.5 m @ 2.51% Li2O in hole LE-16-03. Full details and results of the drilling are presented in Tables 1 and 2, below. Figure 2. Stage 1 work program at Lemare, showing drilling into the known spodumene pegmatite and rock chip sampling of potential extensions to the southwest. 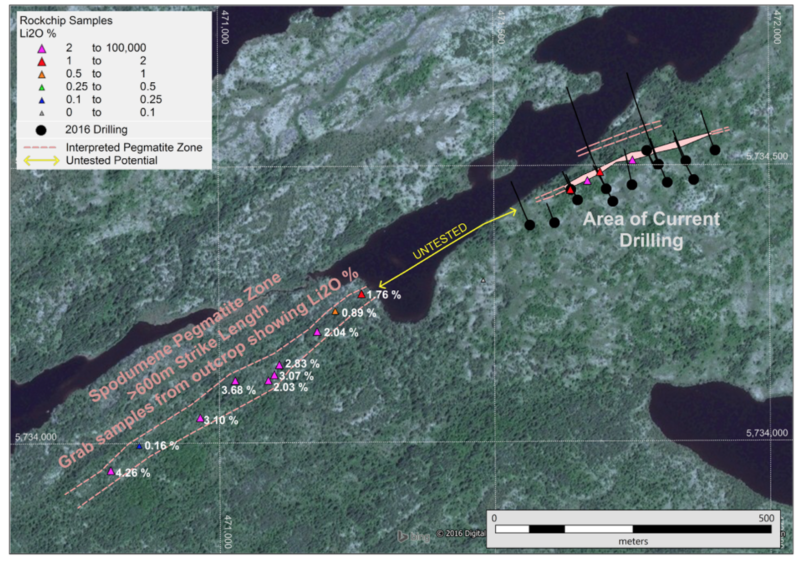 Rock chip sampling along the projected extension of the pegmatite beyond the lake to the SW has identified a new zone of spodumene mineralization over a 600 m strike length (Figure 2). This zone remains open to the SW. 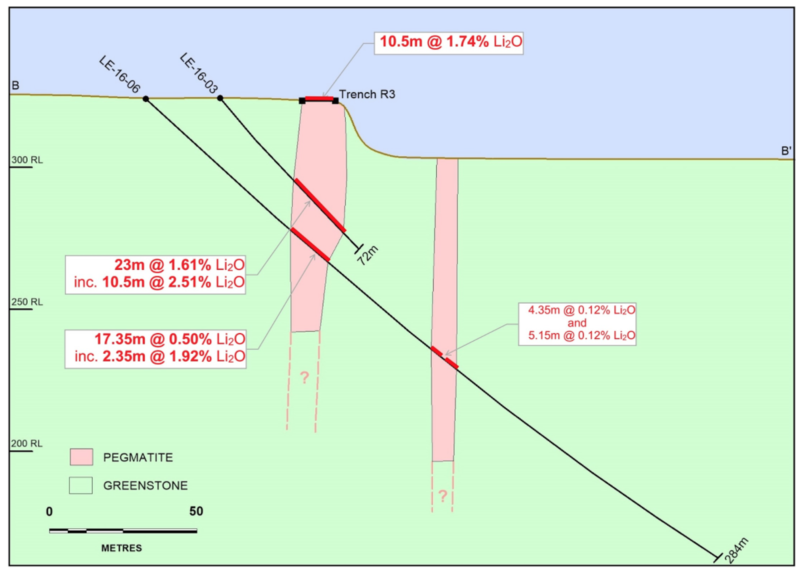 Fairly consistent grades of 2% – 3% Li2O were recorded from intermittent pegmatite outcrops along a 600 m long semi-coherent zone (average of 10 samples is 2.3% Li2O). This represents new mineralization that is even more prospective than the area just drilled and is therefore an attractive future drilling target. 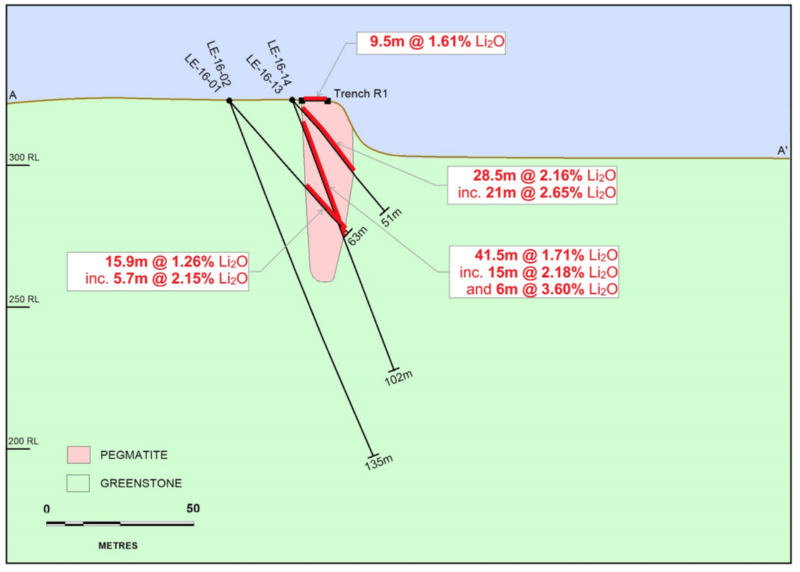 The total Lemare spodumene-prospective pegmatite strike length now exceeds 1.2 km. The new SW zone will ideally require further prospecting, including trenching, and detailed mapping to determine the length and width of the pegmatite zone ahead of drilling the optimal target area. Under the terms of the Lemare Option Agreement, Platypus is earning up to a 75% interest in the project. To maintain its position, Platypus has an initial requirement to spend $800,000 on exploration by March 31, 2017 (extended from December 31, 2016 by mutual agreement) of which approximately $450,000 has been spent to date. 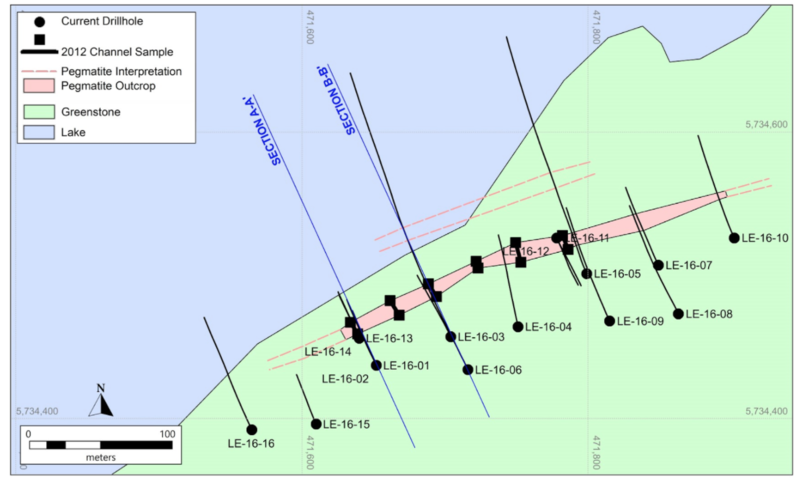 Platypus is considering whether to drill the SW zone now or to defer drilling until after systematic exploration can be undertaken in the summer season. Figure 3. Drill hole location plan, Stage 1 diamond drilling at Lemare. Figure 4. Lemare cross-section A-A’ (Note: looking south). Figure 5. Lemare cross-section B-B’ (Note: looking south). Overall intersections calculated on total width of pegmatite. Inclusive high grade zones calculated using 1% Li2O cut with up to 1m of internal dilution.